It’s gonna be a total Sausage Fest at Brat Haus on Sunday April, 24, 2016 from noon-8 p.m. Guests will celebrate with pretzels, beer, sausage themed activities and a menu of exotic brats made especially for the event. Get a taste of specialty brats including Seafood Sausage, made with scallops, shrimp, fish and herbs simmered in butter. Also on the menu is the Mushroom Sausage made with locally sourced porcini, king oyster, hen of the woods and Phoenix cap mushrooms. To add a little spice to your palate, enjoy the Das Fire Brat made with habanero, green chili, ghost peppers and jalapeno. Or try the Verde Chorizo Sausage packed with peppers, chilies and cilantro. Other brats include the Sonoran Dog, an all-beef hot dog topped with bacon, pinto beans, grilled onions, fried jalapenos, cilantro and crema. Or try the Haus Brat, Sweet Brat, Spicy Brat and All Beef Hot Dog. Add pulled pork to make any brat Smokehaus style. Last year, Brat Haus set a new record with their 93-foot-long brat. This year, they plan to hit 100 feet and beyond with a New Belgium Citradelic Beer Brat. Simmered in beer and made with marjoram, tangerine rind and citrus juices, Sausage Fest guests can purchase a portion of the giant brat for $2 per inch, six inch minimum. 100% of the proceeds will benefit the ALS Association of Arizona. Other menu items include a Smokehaus pulled pork sandwich, pork belly watermelon skewers, and haus made pretzels with beer cheese. To wash it all down, enjoy cold beverages and refreshing brews provided by New Belgium Brewing, SanTan Brewing Company, Krombacher, Grand Canyon Brewing and Sun Up Brewing. Dogs eat free at Brat Haus on Sundays, so bring your doggie friend to enjoy a Dog Brat, the perfect treat for your pooch made with all natural brat of chicken and pork, carrots, squash and more. 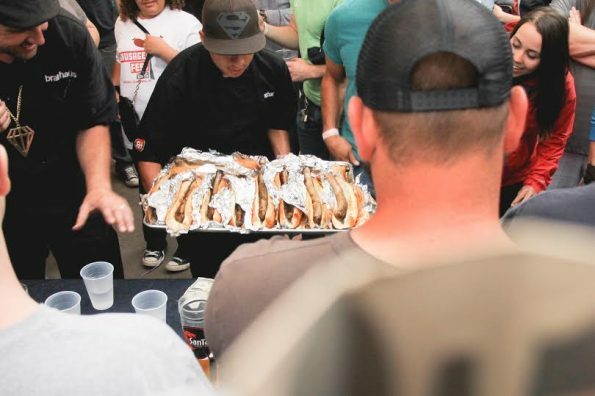 Taking over the open air beer garden at Brat Haus, Sausage Fest will feature Arizona’s longest brat and Arizona’s largest pretzel, a sausage photo zone, sausage making demos, stein holding contests, bag toss, beer pong, and more games. The first 100 people through the door, who are over 21, will receive a complimentary Sausage Fest cocktail, complete with little Smokey, cheddar cheese and pepperoncini garnish. Arizona’s Largest Pretzel 12:30 p.m.
New Belgium Beer Garden Games 12 – 6 p.m.
Arizona’s Longest Brat 1 p.m.
Sausage Demos 1 p.m. and 4 p.m.
Stein Holding (in parking lot) 2 p.m. and 5 p.m. Balloon Twister 1 – 3 p.m.
Presale general admission is $8 if purchased at Brat Haus and day of admission will be $10. Tickets can also be purchased online for $10 at www.brathausaz.com. Sausage Fest is an all age’s event, kids 12 and under are admitted for free. Brat Haus is located at 3622 N. Scottsdale Road, Scottsdale, AZ 85251. Be sure to give them a “like” on Facebook at www.facebook.com/brathausaz. Nestled in the heart of Old Town Scottsdale, Brat Haus features Arizona’s most welcoming beer garden with 28 craft beers on tap. The menu features made from scratch cuisine inspired by European food craftsmen, offering a wide variety of brats, burgers, salads and sides. The open air patio paired with delicious grub and genuine hospitality from friendly servers, makes Brat Haus the perfect Scottsdale spot for a casual lunch or dinner. Elevate your merriment by enjoying one of the patio games including bag toss, ping pong, darts and life-sized Jenga. The patio is also a dog friendly zone – so be sure to bring Fido along for the fun. Brat Haus is located at 3622 N. Scottsdale Road, Scottsdale, AZ 85251 and is open on Sunday-Thursday, 11 a.m. – 10 p.m. and Friday-Saturday, 11 a.m. – 11 p.m. Visit Brat Haus online at www.brathausaz.com to view upcoming events and for the full in house and catering menus. Also, be sure to give us a “like” on social channels at www.facebook.com/brathausaz. ← Previous Previous post: Calling All Foodies for the Ultimate Tempe Experience Sweepstakes!